Franky's Scripophily BlogSpot: What is scripophily ? What is the oldest and the youngest word in the following list ? I bet you are wrong ! I was too. I'll give you the answer right away. and the Greek word "φίλος" (philos), meaning "friend". equity securities, such as a stock certificate (also known as a share certificate), which represents part ownership of a company, society or association. Scripophily involves also the study of stock and bond certificates and their related history. 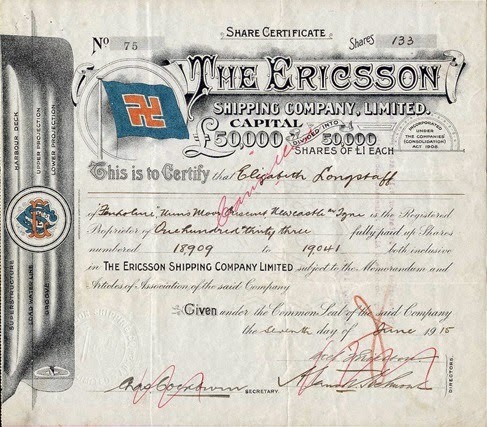 One can be a scripophilist without owning a single stock or bond. Did you know that antique stocks and bonds are easy to find ? Many certificates are common and can be easily and cheaply acquired on bourses and online platforms like eBay. More interesting material is found at dedicated auctions. Some certificates, like this one, are very rare and have a great historical importance and reside only in museums. There are tens of reasons why scripophily items are appealing : security engraving, artistic design, particular vignettes, a pioneering activity, the name of a company, historical background, the name of the holder, a signature of a famous person, and many more reasons. 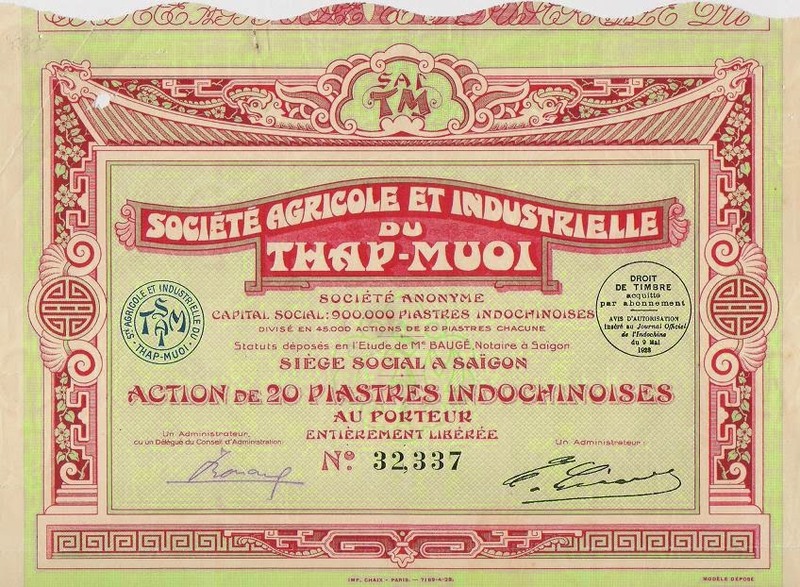 The piaster was the currency of French Indochina between 1885 and 1952. Tháp Mười is a rural district in the Mekong Delta region of Vietnam. Is it really important to make a distinction between true and untrue scripophily? Absolutely not. 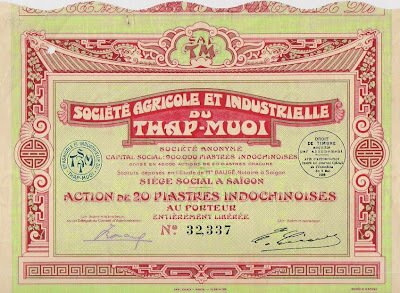 Scripophilists may also collect other related papers, often not regarded as true scripophily, for instance : insurance policies, membership certificates, invoices. The issuers used these papers in their daily business processes. This contrasts with securities that were issued only occasionally during the lifespan of the issuer. Hence, ordinary lottery tickets, drawn on a weekly basis, belong to the former group, and lottery loans to the latter. Combining both types of documents in a collection only contributes to the fun and learning possibilities. Printed by Andrew Reid & Co., Newcastle, UK. The company owned the S.S. Willingtonia, a steel hulled steam cargo ship, built in 1918. In the very same year the ship was torpedoed and sunk by the German submarine UC27. in many cultures seen as a sign of good fortune. Do you know the word in your language ? Is the word for scripophily in your language not listed here? Please let me know, I’ll make sure it deserves its place in the list. How old is the word scripophily ? The word scripophily is actually a relatively modern word, as you can see here in Google’s Ngram chart. This tool lets you trace the usage of a word or phrase during the past five centuries (!) by seeing how often it's appeared in books over that time span. The word Scripophily started appearing in books halfway the 1970s. As you see, the word Scripophily started appearing in the 1970s, which is pretty modern when compared to words like android (17th century) and computer (16th century). Tip : The more (online) scripophily friends you have, the more you will share knowledge and have fun. You should join a club or participate in a social media group ! PS : Scripophily is also the name of the magazine issued by the International Bond & Share Society (IBSS), see more here . Synopsis of the Ocean's Twelve movie, starring Brad Pitt, Catherine Zeta-Jones, George Clooney and Julia Roberts. In this movie, a gang of thieves pick a European target : " the world's oldest stock certificate, which was issued by the Dutch East India Company in 1602, worth around 2.5 million euros, and kept in Amsterdam. " Can you help me to reach more people by sharing this post ? Learn from this quick introduction ! Please use the contact form at the bottom to tell me about it. I'll correct the issue asap. Past issues of Scripophily magazine are now available to the public. Visit Franky Leeuwerck's profile on Pinterest.